Educational opportunities should not be determined by your family’s income or the neighborhood in which you live. Teach For America is developing a movement of leaders who will help drive change at every level of our education system toward the goal of closing the opportunity gap in America. These leaders start their paths as corps members who teach for two years in urban and rural high-need communities and help students make the academic progress that expands their opportunities. Deeply affected by their teaching experience, our alumni continue to advocate for students and build lasting change in many different roles and fields. This year, 11,000 corps members are teaching in 48 regions across the country, while nearly 32,000 Teach For America alumni continue working from inside and outside the field of education for the changes necessary to make a great education a reality for all. You have the power to change things. 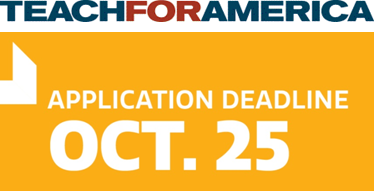 Apply<https://www.teachforamerica.org/online/info/signUp.wbfl;jsessionid=56DC44E534030A2EBEDDB0EB9B8B7D79?_flowId=signUp-flow&_flowExecutionKey=e1s1&gt; to the 2014 Teach For America corps.